I'm planning on another through hike of the JMT this coming summer. I'll take an iPhone 6 and an Inreach with me; both will need to be recharged. I feel that a charger using lithium non-rechargeable batteries would be the lightest option but have no idea of which one is light or reliable. Any suggestions? Thanks. Thanks. This looks like a good answer. And, I like having projects. Have you considered using a foldable solar panel such as goal zero(not product placement haha, just what I have)? I have it hooked to the top of the brain on my pack so it gets direct sunlight all day. Much cheaper than continuously buying batteries and more environmently friendly. Thanks for the suggestion but the pack top solar power panels I have looked at typically weigh well over a pound. 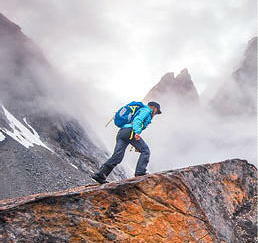 For the way I use a cell phone on the trail (music, Kindle app and Inreach keyboard) I need about one charge per week. I already have a rechargeable 6400 mAhr battery pack that will give me two full recharges. It weighs 4.4 oz. and gives me about three weeks of phone use starting with a fully charged phone. I am hoping to lighten from that. Two non-rechargeable lithium cells weigh about 1.5 oz and should recharge an iPhone at least once. I am hoping to find something that weighs around 2.5 oz with lithium cells. There are roll-your-own chargers in this range: I’m hoping for a manufactured version. The solar arrays are too heavy for my level of phone use. People have been wishing for and trying to do this for a while. Solar panels get better all the time and it may become reality. 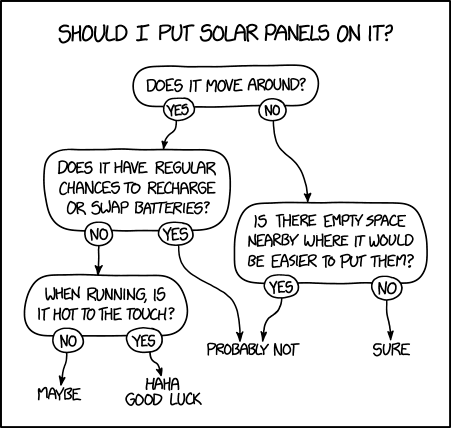 The issue is, last time I checked (I am not up-to-date), that you need the sun directly impinging on the panel. A slight angle off of 90 degrees (between panel and incoming light) kills the panel. Walking around all day, your panel will rarely be positioned correctly. A well designed panel will result in little to no charging. A cheap panel will drain the thing it is supposed to be charging. You can get the same effect for less money and it actually works by bringing a rechargeable battery pack and then charge it (at home) with a renewable power supply (purchased from your power company or home installed panels). And, to take it a step further, you could pair the Minty Boost with this for LiPo power. Proceed at your own risk! LiPo batteries can be... unforgiving. A common misconception. Solar panels are charged by daylight, not sunlight. More than just semantics there. Direct sunlight is certainly the most efficient, but any daylight can charge a panel, even on cloudy days, since some light filters through the clouds. They just won't charge very much/put out much power on such days.